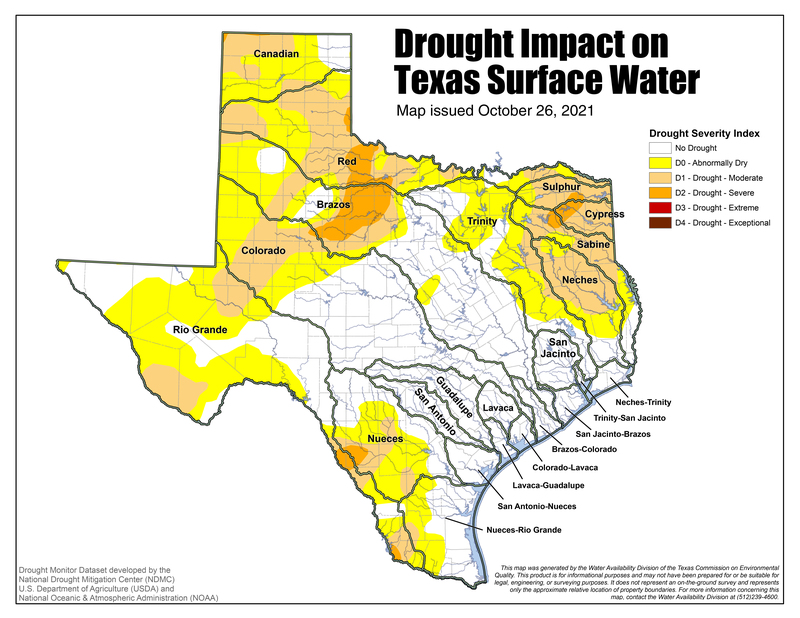 Current Drought Conditions in Texas and the United States | Freese and Nichols, Inc.
Drought conditions improved overall. DSCI (drought severity and coverage index) decreased from 21 to 18. Two strong storm systems brought severe weather and widespread precipitation to many areas across the country. Temperatures generally averaged below-normal in the western two-thirds of the United States and above-normal in the eastern third of the country. Widespread moderate to heavy rains resulted in up to one category improvements in central Texas. Conversely, the rains missed southern sections of Texas leading to persisting drought conditions in the area. The recent precipitation removed the lingering area in Oklahoma under abnormally dry conditions. The state is now free of any drought conditions. The recent precipitation (northern Louisiana received up to six inches) improved both abnormally dry and moderate drought conditions within the state. Moderate rainfall occurred throughout much of the state with a few exceptions. Locally heavy rains fell throughout northeastern Georgia while minimal precipitation was observed in the southern portion of the state. Where heavier totals fell (more than 2 inches), one category improvements were made (near Savannah, central and west-central Georgia). In contrast, areas that missed out on the rains (less than 0.5 inches) saw D0 expand slightly. Conditions remain unchanged from the previous week in North Carolina. The majority of the cumulative precipitation is projected to occur in the eastern portion of the country. To check out the forecast near you, try the NOAA Quantitative Precipitation Forecast map. The website links below include the current drought monitors and other current drought conditions information. I have a project in school on environmental issues and I used this and my teacher loved it! I have to do a reflection on what I could do to help, so this is perfect!